The problem isn’t coverage of the Koran-burning idiot; it is that we are not yet used to a world in which there is too much journalism. The breast-beating over the coverage of that idiot who’s threatening to torch copies of the Koran struck me as a little overwrought. It’s as though a whole bunch of people forgot that what we do in journalism is go see what’s happening in the world and then report back. We can debate forever the value of much of what is reported, but it’s the second part of my tweet I’m most interested on exploring here: too much journalism. That age is gone, of course. In its place, we have access to all of those publications and all of that news, and in many more places than just those publications. And we have the death of the portal (Facebook, perhaps, aside). The result is that we no longer have a window or two on the world: the internet has pretty much knocked down the whole wall. Everything from everywhere comes pouring through. We readers have the easy part here: turn on the tap and wade in. Getting used to a world with too much journalism, by which I mean a world in which all of the journalism is more or less available, is much harder for newspapers and other media. They’re behaving as though journalism and information is still scarce, and in many cases they need to in order to serve a diminishing but still present traditional audience. It seems to me that it’s inevitable there will be times when too many journalistic assets, ranging from the boots on the ground to the number of column inches, seem too much devoted to matters of too little importance. This is where we appear to be now: newspapers can’t, for much longer, be what they used to be but have not yet figured out what they need to be, where they will fit, in a world that much of the audience already inhabits. 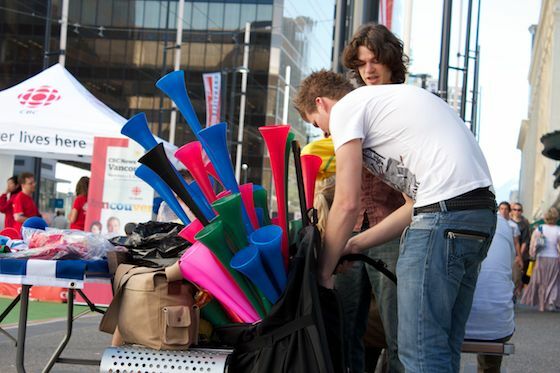 Vuvuzela sellers just prior to the start of Wednesday's game. They did not do great business, although a few of the plastic horns were sounded. 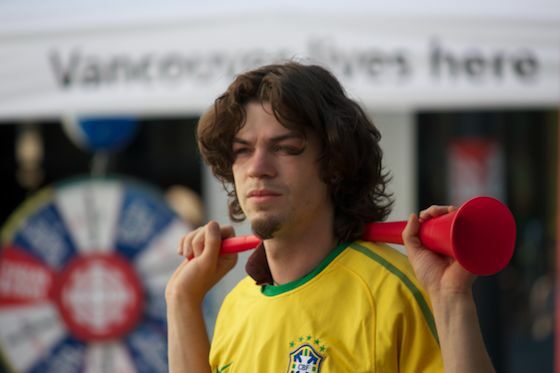 The vuvuzela seller started the afternoon in a Brazil shirt, but quickly changed to German colours. German fans were out in force just before the game; by the opening whistle, Spanish supporters pretty much matched their numbers. 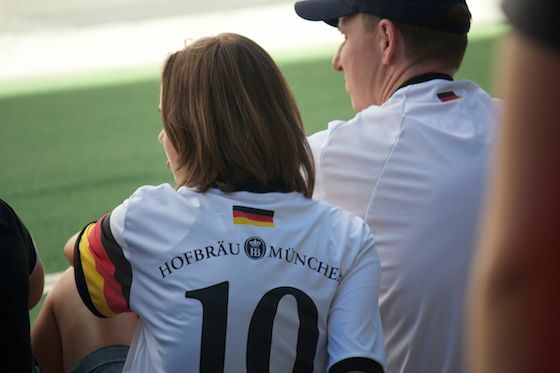 Curbside seating, and plenty of tension, for a young German fan. 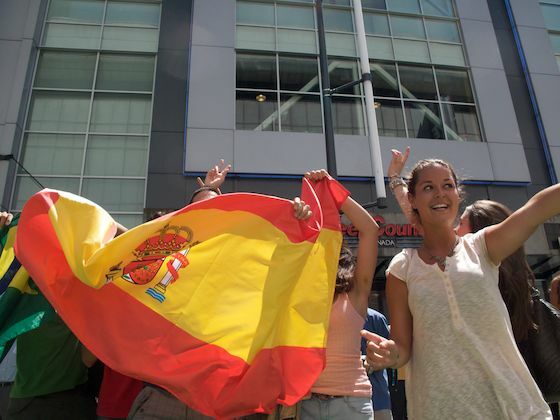 Spanish fans react to a close play for their team as the game plays on. 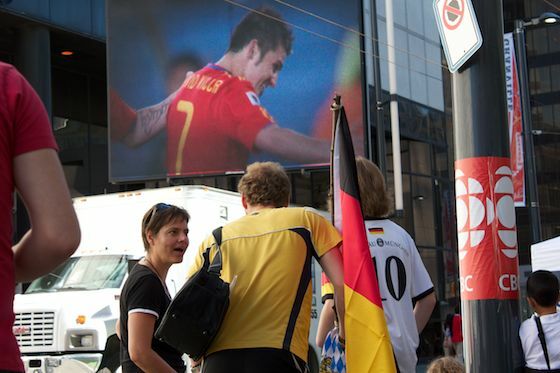 Game over: let the flag-waving begin. 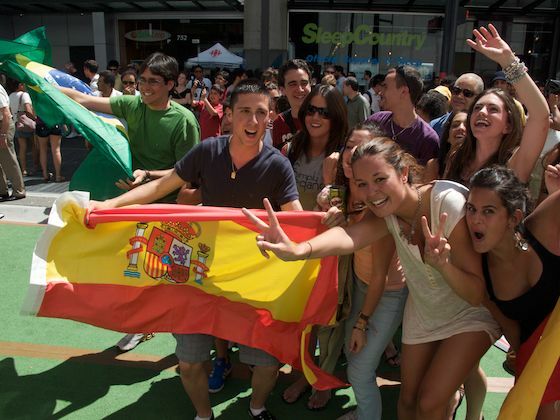 Ah, youth: Celebrating for the cameras as Spain closes out Germany 1-0. Singer Katerina Topazi was showered with carnation petals during her performance for the Vancouver Greek community Friday, May 28, 2010. Throwing carnations at musicians is a Greek tradition. I saw this in a Toronto Star article yesterday: John Paton is apparently one of those advising the new owners of chain. Paton is the recently named head of the Journal-Register newspaper group, and when I saw him speak at last month’s International Symposium on Online Journalism in Austin, Texas, he drew a big round of applause, from an admittedly news- and tech-geeky audience. The nut graf was something like this. 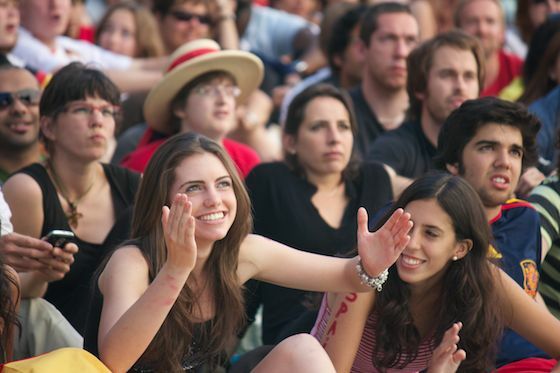 J-R is aggressively adopting a strategy of digital first for its newsrooms. To (horribly) paraphrase, the digital stuff is “easy stuff” and if you can’t do the easy stuff well, you can’t do the harder stuff — print — effectively. The Canwest newspapers I’m most familiar with, the Vancouver Sun and the Province, have already moved toward online first, although online augmentation of print best describes their approach. It will be interesting to watch what happens with the Canwest papers and any digital-first strategy, given a couple of hurdles that newspapers everywhere, it seems, are struggling with. One is putting digital first in a process designed to efficiently deal with a couple of deadlines a day and the production of a single, fixed product. 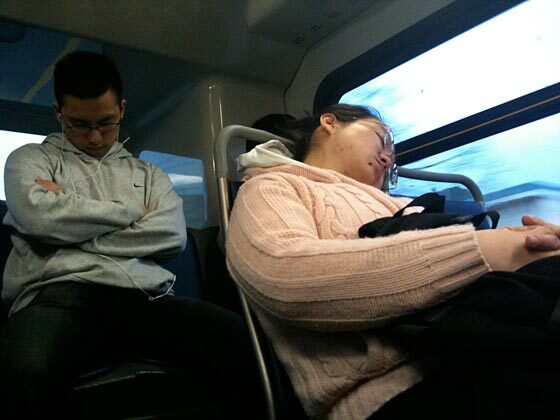 That’s an issue of mind-set and of internal processes and organization. I recall Paton saying that the day’s print issue would become the final product of the day’s online reporting. That’s a big switch. Another — and this is particularly relevant to Canwest — is division of labour. Paton spoke of a newsroom where three people are doing 10 things, not 10 people each doing one of the 10. That may reflect a couple of realities, which include the financial hit newspapers are continuing to take and the efficiencies that multimedia reporting can create. Please note the use of the word “can.” Simply asking one person to do more than one job is not in any way efficient. Division of labour is a huge issue with Canadian newspapers, which are by and large unionized, with rules and regs that define who does what, and who can do what, again premised on a process that is aimed squarely at a single product at the end of the day. Canwest’s newspaper division will emerge from bankruptcy with the major debt holders paid off, new owners and a new lease on life. That’s great news. Relieved of the debt that dragged Canwest into oblivion, the money-making newspaper division will have a chance to carry on. Even better news comes in the early words of Paul Godfrey, who will head the new company. He has said that all pension obligations and the like are intact, that all full-time employees have jobs, and so do “substantially all” of part-timers. All this is great news for the newspapers and the people who put them together. One is that the money-losing National Post is going to be a continuing drain on the chain. It has rarely made money in its 10 or so years, and the general trends among newspapers (falling circulation, disrupted advertising and overwhelming competition for attention), aren’t in its favour. Another is the plan of the new company to go public. The health of publicly-held companies depends on keeping shareholders happy. In the newspaper biz, that’s meant focussing on quarterly results and high levels of profit. The first interferes with longer-term planning; the second is something most folks don’t think we’ll see again in most forms of mass media. It is possible, however, for the chain to focus on investor returns by concentrating on titles that generate high levels of profit (such as newspapers with local monopolies) and cutting others adrift. Canwest’s secured creditors come out of the deal happy, because they get their money back. The new owners include some who bought Canwest debt at a deep discount (reports as as little as 30 cents on the dollar), which might make it tempting to get out with a healthy profit if there’s a successful IPO (or to get out quickly if the IPO falls flatish. While the news is good, for now, it wouldn’t surprise me if there aren’t more ownership changes coming for some of the newspapers that make up the chain. 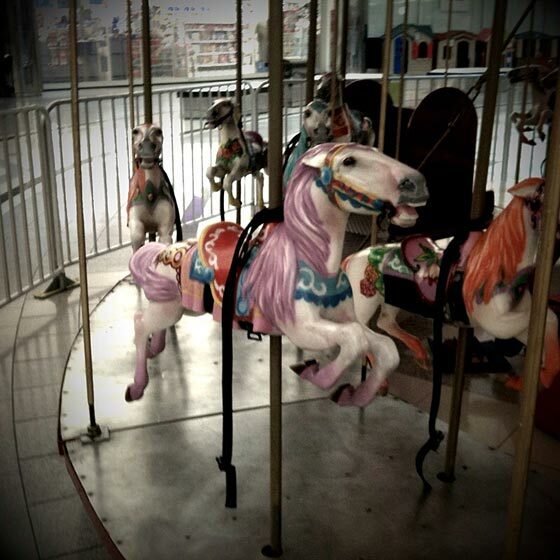 Horses await their riders at a merry-go-rounds set up in a local mall. iPhone photo; Helga effect in CameraBag; sharpened in Photoshop.